I don't know about you, but my wish list seems to grow by the day! I've managed to narrow my list down to a few items that I'm determined to get my hands on this month! A Crystal/Glass nail file: I actually used to have one of these but it got lost in the moving house process after I finished university. I'd almost forgotten about it until I read Hephzibah's blog post at Good For Me, Good For You. These nail files are so much better for your nails than the bog standard emery boards and they pretty much last forever too! Also the more you use them, the stronger your nails become. I would thoroughly recommend getting one of these if you don't already have one! RMS Beauty 'Un' Cover-Up (RRP £28.00): I've heard so many good this about this product lately. It's made with 100% natural ingredients and can be used as a concealer or a light foundation to even out your skin tone without drying out your skin. Apparently is blends into skin so well that even guys can use it! Madara Moon Flower Tinting Fluid (RRP £23.00): I had a sample of this in my Amarya beauty box last month (reviewed here) and totally fell in love with it! I can see myself wearing this a lot in warmer weather as it's so light and natural looking and gives your skin a wonderful glow. Weleda Skin Food (75ml RRP £8.95): I've had this in my sample stash for a while (see here) but I only got around to trying it out last week. Perfect for hydrating dry skin, this is one of those cult classics which I think everyone should have in their beauty collection! NEOM Invigorate Travel Candle (RRP £15.00): I've yet to try a NEOM candle and this one sounds perfect for me. It's described as an uplifting zesty scent with grapefruit, bergamot and lime and is supposed to promote positive thoughts and boost moods! These candles are natural too, made with vegetable wax and pure essential oils so they don't give off any harmful toxins. Oooh I really want to try a NEOM candle! What a great selection of products for the summer. We love Madara - they're such a great natural brand, and the tinting fluid looks great on you! 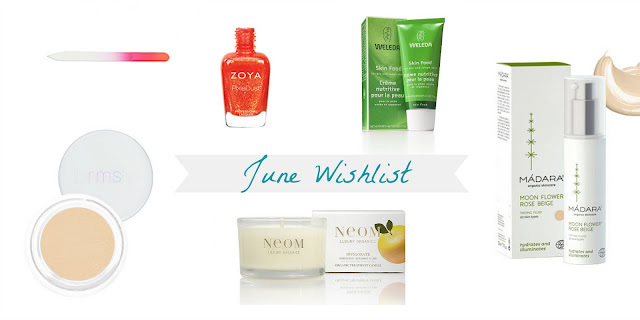 I love the weleda skin food, and really want to try neom candles too!